Marco loved his Super Stepper Running Shoes when he saw them in the store–but on the first day of school he discovers that everybody was wearing Jupiter Jumpers. He wanted those shoes. He needed those shoes. But his dad said no, and his mom said he should earn some money and save up for them himself. Marco never had a job before! So he grabbed his trusty Field Guide and his best friend Amelia for a quest through the wild world of money–a quest that teaches them some unexpected things. 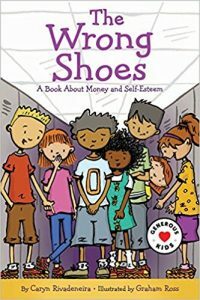 Especially designed for kids 7-8, The Wrong Shoes teaches kids about money, hard work, self-esteem, and the real value of the stuff we own.